My niece visited our house the other day and, as she was leaving, she paused to jot down our land line phone number, which she had lost. I told her the number and added, “Anyway, we’re in the book.” But I immediately recalled that Verizon and AT&T, among others, have been moving toward discontinuing phone books. Although phone books are a nuisance to have around the house, and although I can’t remember the last time I used a phone book instead of the Internet to look up a number, I’ll be sorry to see them go. I’m an avid phone book reader when I’m away from home. I study such things as how many people are listed with my surname and how many with my wife’s surname. There are seldom more than one or two – often none. Whenever I find one it’s like spotting cobalt sea glass. I also thumb through to see which name generates the longest list in that locale – Smith? Patel? – and which names catch my attention because they’re familiar or odd. Reading the phone book in Iceland, incidentally, is an offbeat experience, because most people in Iceland don’t have family names as such. 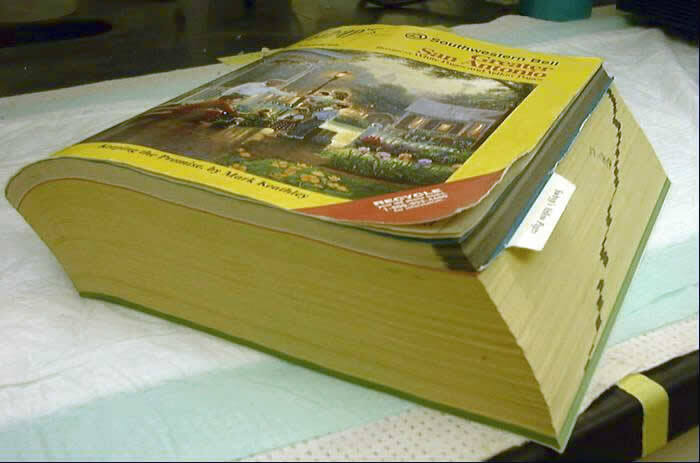 Folks are listed in the phone book by their first names, patronyms, addresses, occupations, and then telephone numbers. The patronym consists of a person’s father’s first name and a suffix that indicates whether it’s a son or daughter. So the Icelandic singer would be listed as Björk Guðmundsdóttir, because she is the daughter (dottir) of Guðmundur Gunnarsson, who is the son of Gunnar. 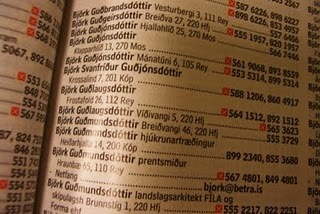 If you look closely at the page to the left, you can see listings for several people who share Björk’s name. 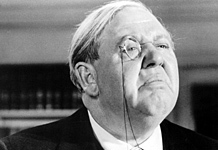 It was often said of the actor Charles Laughton that he could make an audience weep simply by reading the phone book aloud. That was meant as a compliment to Laughton, but I think I’d be reduced to tears if I had to listen to any actor read the phone book. I, on the other hand, will miss those out-of-town opportunities to read the listings to myself and provide occasional commentary to anyone without the sense to leave the room. Meanwhile, my first thought after I told my niece that we’re “in the book” was that the expression “in the book” might disappear from our language if the trend to eliminate “the book” continues. Although I know it’s an inevitable process – idioms coming and going – I always regret the loss of such expressions. I’m old enough, though, that “in the book” could last as long as I do. After all, the rotary dial started disappearing from telephones in the 1960s and has been virtually non-existent for several decades. 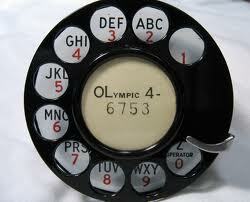 And yet, many people still speak of “dialing” a number when, in fact, they’re entering the number with a keypad. Come to think of it, I’m so old that I’m older than rotary dials. When we’re in the car we still “roll down the windows,” even though I can’t remember the last car I rode in that didn’t have power windows. 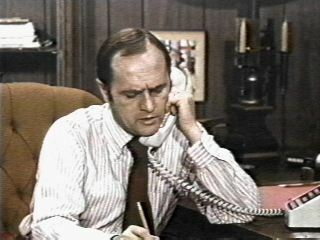 The other problem with phone books is that more and more people have jettisoned their land lines and just have cell phones. It will seem strange if the books disappear entirely — although your traveling companions may not miss them. On the other hand, there are some new expressions entering the lexicon. “411” as an way of asking for information is an example. Some of my younger friends will say, “Give me the 411 on that restaurant”, meaning tell me about it, give me your evaluation. Interesting.